Up at 6:00 AM, out the door quick, and on the road by 8:00 AM. Started on Bike Route 5. New York has an extensive network of on-road bicycle routes that few people know about. Bike Route 5 runs across the state from Niagara Falls to Albany, Bike Route 17 follows the state's southern edge from Lake Erie to the Hudson River, and Bike Route 9 goes from New York City to Montréal. Are there more? Who knows? The state has made no effort to publicize the existence of these routes. They make cross-country cycling quite easy. Just follow the hand-sized signs. New York is one of the best states for on-road touring. About 40 miles from Medina to Rochester on New York Route 31. Smooth pavement and ample shoulder space. Easy cycling. 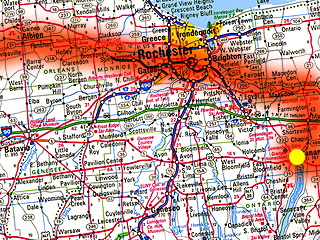 In the metro Rochester area the route gets more complicated for ten to twenty additional miles. South on Howard Road in Gates Center then east on Route 204 followed by a series of city streets leading to Elmwood Road. East on Elmwood past the University of Rochester. This is all city riding. Heavy traffic but plenty of room. Occasional construction as mandated by the transportation gods. Just keep following the signs. Crossed the Erie Canal twice. Saw a paved towpath both times. I think it's time to get off the roads and try the canal. Noon strikes and I've gone 50 miles. I'm averaging over 12 mph again. After a week of nine and ten mile per hour days, I'd call it a good morning. The afternoon was pure evil in comparison. The towpath was paved for only two blocks. After that it was crushed stone. OK, I can live with that. Pavement reappears from time to time, especially under bridges. The pavement looks beautiful from the overpass, but it's all a part of the master plan to destroy touring bikes. Last year I stressed my hub on the gravel surface and never recovered. It was one popped spoke after another that began on this ribbon of gravel. This year I was much luckier. Twenty or thirty miles down the trail I suffered a flat tire. The crushed stone ended and the trail diverted on to an unimproved access road studded with golf ball sized stones. Tore off the tire and discovered a pinch flat at the overlap point of the tire liner. How ironic. The tire liner that was supposed to reduce the likelihood of punctures was partially responsible for the flat. It's small so I decide to try one of the glueless patches. Step down to the canal to wash my hands. Sure is nice around here. Quiet, picturesque, hardly any cyclists though. Back on the rig and moving along nicely. Doesn't sound evil? Just give it time. Trying to decide when to turn south. I want to head down to the Finger Lakes soon. I stop at a road crossing to scan the maps. Unbeknownst to me, while I was sitting there enjoying the afternoon, air was slowly leaking past the glueless patch. What a waste. I guess now's the time to head south. Canandaigua is a big place. I ought to be able to find a motel there. Further down the canal is a mystery. I feel like I could do 120 miles today, but I better go with the sure thing. Head south on Yellow Mill Road, a pleasant rural back road. Top up the rear tire and move on. Two miles later I have to pump it up again. Now I notice the sky has changed. Afternoon storms are brewing all around. It's just a matter of time before one hits me. It's not far to Canandaigua. If I start taking the bike apart to replace the tube I'll be hit by a thundershower halfway through the job. Top up the rear tire and move on. One mile later, it's flat again. Top it up. Half a mile later, it's flat again. Lightning bolts are striking less than a mile away. Top it up. Ride. Top it up. The pump breaks. Now I've had it. Time to start walking. I can see Canandaigua when the rain hits. Just keep going until I hit a gas station. Walked nearly a mile and all they have is a weak little coin operated air pump that couldn't put out more than 35 psi. Ride for an eighth of a mile and then back on foot. Here I am walking right down Main Street and no retail in sight. Hit the commercial district and no sign of a bike shop. The rain cuts, but I'm damp again. All the way to the end of town, then east on US Highway 20 to the strip mall ghetto. Heard there was a bike shop there. Walked all the way to the end of the mall before I hit it. Nobody on duty to do repairs but I buy a new pump. Walk across the exurban traffic flood to a motel. No Vacancy. It's Empire Farm Days. Walk nearly a mile down the highway to the next motel. Only one vacancy left. Third floor in the last third-floor building in the complex. No elevator. I've walked nearly eight miles. My average speed fell to a weak 10.6 mph. None of this would have happened if I had bailed on the canal at the first sign of rough pavement. Two years in a row. Don't get on the canal towpath with anything less than a hybrid and make sure you're not carrying any load. The Erie Canal is pure evil. So are glueless patches. Fixed the tire in the motel room. Walking with the flat has twisted the tire liner. Time to chuck it. The phones work. At last I can send out the backlog of mail. Hello everybody. It's me.